Yesterday, I read this headline: “Man Recovering After Fall from Grand Canyon.” In a flash, it all came back to me – the longest thirty minutes of my life. 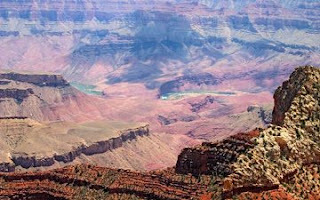 The Grand Canyon was beautiful – I know that because of the pictures we took. I don’t really remember the lovely sight. All I remember is counting heads and saying, “Guys, be careful.” Or “Not so close.” And Dad saying, “Oh honey, they’re fine.” And their crazy antics, designed to make me all the more terrified. When I recall that feeling of panic, that fear born from love, I remember with wonder that there’s One who loves them even more than I do. He knows no fear, and panic isn’t even in His vocabulary. And He never has to hold His breath or count. He knows them, loves them. He’s much more than an eternal Santa or the big man upstairs. He doesn’t promise us a perfect life, but He’s by our side as we maneuver the rocks. And He gives us grace – enough to make it through the longest thirty minutes of our lives. So true. We visited the Grand Canyon when my son was about 7, and I remember that watchfulness. I love the direction you took this post, though, and you're so right. You've brought back memories of seeing the Grand Canyon when I was a child--and how my mom kept saying, "You're too close, stand here." Now I understand! I love what you've said about our Father, by our side as we maneuver the rocks. I have been avoiding my husband's request to visit the Grand Canyon. We were going to go when I had a stroller boy, but he got the chicken pox instead. But I still remember the lack of rails and I know I would be tormented watching my kids instead of embracing the view. Oh my, how I love your blog title! I totally get that, and I am so grateful for people like you that have a heart for moms. So happy to meet you! I totally get that feeling! It literally takes your breath away to think about what *could* happen. I like how you segued into our Father's love for us. He often challenges us with canyons without rails and trusts us enough to get close but not that close. The only difference is that He knows if we fall, He will be able to save us. Oh, Laura, I bet that was scary. I would be one of those "crazy" ladies herding everyone together. Yes, even when I don't know where my children are, He does. And that's what counts, right? I've never been there, but my mom tells me it's one of those places my great-grandmother always wanted to see but never made it. I plan to go one day for her (I'm terrified of heights and probably wouldn't go for my own sake). You're right about those moments where you forget to breathe for fear of what could have happened, what almost happened, or what you thought happened. And I beg God daily to hold her in a way I can't. I haven't found the grace yet, but I know nothing will happen to her without Him watching. My husband is a rock climber. I remember one vacation we took when my daughter was constantly flying off rocks into (hopefully) her daddy's waiting arms. But she had such complete trust and she always trusted he was watching her. Sometimes all she'd say was, "Daddy" and start flying. It was her job to locate her and open his arms. Trust. It's what our Fathers do best.